It's been a while since I posted a dessert. You know me...it's got to be something chocolate! These brownies are ah-mazing! They are rich, dense and delicious but contain NO OIL! Yes, They still feel moist and decadent! I made a couple of modifications, and the result was exquisite! Preheat oven to 350 degrees F. Line a 8 x 8 inch pan with parchment paper and set aside. In a separate bowl, blend the coconut sugar, maple syrup, vanilla, nut butter, applesauce, and flax meal mixture until smooth. In a third bowl, combine the flour, baking cocoa, baking powder, and salt. Add to the sweetener mixture and stir to combine. Bake for 30–35 minutes, or until a toothpick inserted into the center comes out clean. This looks terrifc for a brownie recipe! 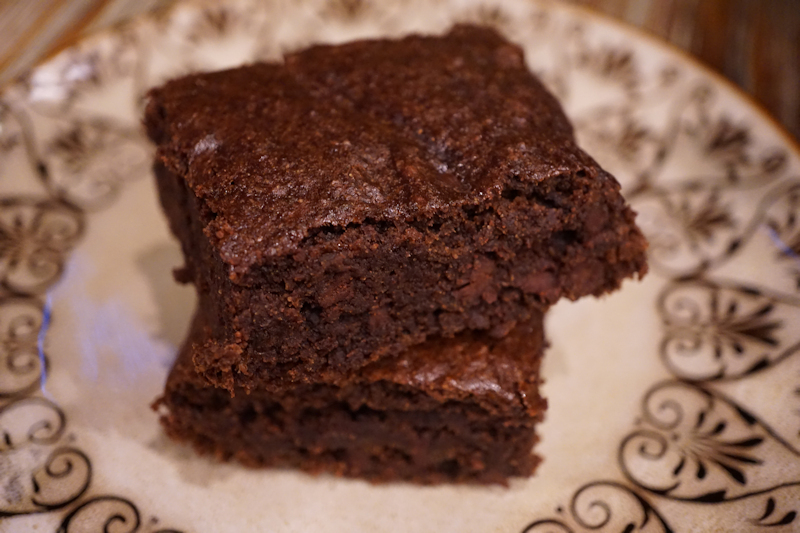 Everyone loved this brownie (although some said it tasted more like 'cake' than brownie)!